For those of you who don't already know, the Lincoln Bailgate branch of the Embroiderers Guild is undertaking a project based on the Luttrell Psalter - LP for short! The LP is a medieval manuscript which was produced for Sir Geoffrey Luttrell who lived in Irnham (near Grantham) and this is one of the reasons it is so relevant to our group. There's going to be a big exhibition at The Collection in Lincoln next year, which will run from May to September. 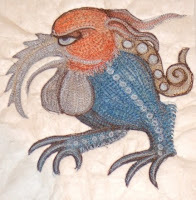 We are producing embroidered panels based on the imagery in the Psalter. The LP lives at the British Museum in London and you can find out more information about it by clicking here. 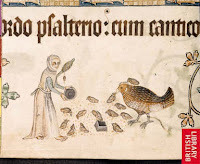 The story about the Psalter and medieval life is fascinating. We run monthly workshops to support members in this project, helping with the design and techniques to use. The next workshop is July 26th at Bailgate Methodist Church, Lincoln. Please let me know if you would like to take part in the project. There's also a sister project in Lincoln about the LP, which concentrates on reproducing the historical elements for a short film that is being produced for The Collection. Click here for more information.